I received this book for Christmas as part of the Penguin Books Great Food series. The books in the set are reprints of classic food writing, some are memoirs more than traditional cookbooks. 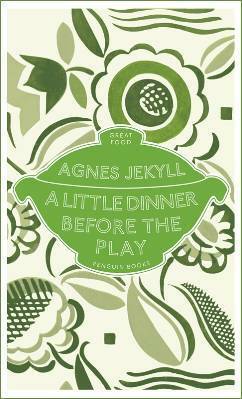 This book, A Little Dinner Before the Play, consists of extracts from The Kitchen Essays first published in 1922. I really enjoy cooking and reading about cooking and this was a fascinating glimpse into some historical perspectives about food, food service, and cooking. Political correctness is nowhere to be found here with chapters on what to feed the too thin and the too fat, along with ideas as to why the guests are too thin or too fat. There are many recipes that I have tried in more modern formats and much basic cooking. There are even ideas for Meatless meals which is a theme that continues on today in the common meme “Meatless Mondays”. I enjoyed reading this book and look forward to reading others in the Great Food set that I have. This entry was posted in Book Reviews and tagged book review.